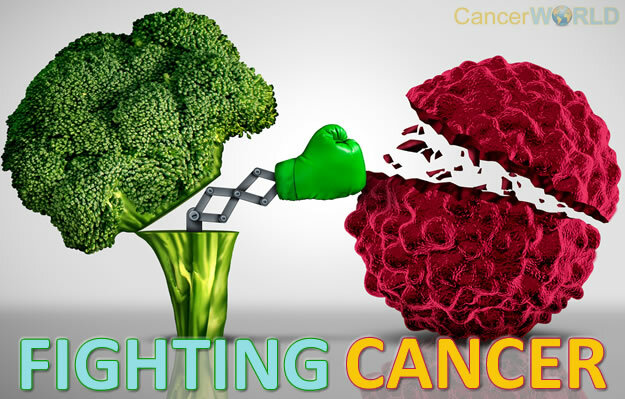 Find proven Cancer Fighting and Prevention foods and tips as per latest research. Cancer is world’s deadliest and painful disease with remarkable increase in the number of reported cases, every year. Cancer is the second leading cause of death in USA, and every day it seems we learn about a new risk factor or something we need to stop doing or avoid to reduce our chances of getting this deadly disease. Every year it is estimated that at least 8 million people die from cancer worldwide. Many are fearful of getting it. Cancer risks looms over everyday life, with each person living at their own risk for developing one type or another at some point. Genetics plays its role contributing in cancer risk factors, but the chances can increase or decrease depending on the part each person plays to reduce their risk. One way to fight the odds of cancer or to prevent cancer at the very first place is what food and lifestyle you choose. The good news is, modern research shows that cancer prevention is possible by reducing cancer risk through making food and life style changes. By consuming a variety of cancer fighting foods, adopting healthy lifestyle choices and routines you’ll be able to dramatically lower your cancer risk. Assuming you have cancer, this combination will make a huge difference in your recovery. There is no evidence that a single fruit or vegetable can successfully fight or prevent cancer on its own. However, consuming large amounts of vegetables particularly of the green kind, together with fruits, whole grains and beans has been proven to provide the body with a variety of nutrients that boost the system’s immunity and stave off cancer. Fruits and vegetables are rich in antioxidants such as Selenium, vitamin C, vitamin E and beta-carotenes. These powerful vitamins help the cells function optimally and protect against cancer. Brazil nuts are a rich source of Selenium. According to research conducted at the Dartmouth medical school, Selenium, a powerful antioxidant, was discovered to exponentially lower the risk of bladder cancer in women particularly those approaching menopause. Colo-rectal and lung cancer patients whose blood levels were spiked with Selenium showed great improvement after a few weeks on the treatment. Selenium works by protecting the cells from the effects of free radicals and suppresses the formation of blood vessels that nourish cancerous growths. According to an Iowa women’s health study, people who ate at least two cloves of garlic a day had a fifty percent lower risk of colon cancer compared to those who ate none. Garlic contains allyl sulfur compounds. The compounds stimulate the immune system’s natural defenses against cancer and have the potential to empower the system to flush cancer causing chemicals and even cause the cancer cells to die naturally, a process called apoptosis. Data summarized from 3000 cancer research studies have revealed that higher blood level of Vitamin-D is associated with a lower risk of many cancer types. Before you pop a supplement, ask your doctor to check your levels (which should be 40 to 60 ng/mL for cancer prevention) with a simple blood test so you take the right amount. It’s a fact; some people consume far more meat than is healthy. What does excessive consumption of meat have to do with cancer? To begin with, meat often contains very high levels of saturated fat. Numerous studies have linked high fat diets to cancer. Secondly, a lot of meat contains antibiotics and hormones that the animals may have been injected with. Continual intake of these hormones and antibiotics can cause havoc in the body and lead to dangerous cancerous growths. If you’re a meat lover you don’t have to cut it out permanently. Just reduce your portions and your frequency of consumption. A good habit is to ensure the total amount of meat in your diet contributes no more than fifteen percent of your total calorie intake. Also, keep off processed meats. Hot dogs and salamis are two major culprits. Consuming purely organic meats from animals that have not been fed antibiotics or growth hormones will serve your body well too. According to the National Academies of science, perchloroethylene, a solvent commonly used in dry cleaning, has been linked to leukemia, liver and kidney cancers. The main danger with perchloroethylene is to the handlers of the solvent. A simple and more effective solution is to use less toxic alternatives to clean apparel, mild soaps and detergents for example. Scans and x-rays are great medical diagnostic tools. However, when overused they become detrimental to the body. According to Doctor Barton Karmen, a medical officer at the Leukemia and Lymphoma society, x-rays and scans are dangerous to white and red blood cells when used excessively. The scans produce radiation. This radiation in high doses can trigger Leukemia and other cancerous disorders. The solution: If you decide to change doctors carry all your scans to ensure they are not repeated. Also, enquire if an MRI or an ultrasound could work as a substitute. Folic acid, when taken in sufficient doses as prescribed by a physician works in favor of the unborn child to prevent birth defects. Consuming too much of the synthetic form however, has been linked to increased risks of colon and lung cancer for pregnant women. This is according to a study conducted by the center for disease control (CDC). Men who consumed large amounts of supplement pills rich in Folic acid were found to be at a higher risk of getting prostate cancer. Carefully read the supplement labels. If synthetic supplements and multivitamins posses more than 400 mcg of folic acid it’s best to avoid them. CDC discovered that half of supplement users who consumed pills with more than 400 mcg of folic acid usually exceeded the 1000mcg per day of Folic acid, a level that creates an environment for cancers to develop. Women who spend more time sitting are at a higher risk of colon cancer than women who spend less time on a chair. Women can decrease the risk of endometrial and postmenopausal breast cancer by choosing to become more fit. A simple solution is to use a standing desk. Not an option? Walk around at least every hour for a few minutes. Blood flow will be enhanced leading to a much healthier body. Cardiovascular exercises work the heart muscles, increase the rate of blood flow to the organs and stimulate the body to get rid of waste. Cardiovascular exercise also leads to weight loss. Losing weight reduces the body’s production of the female hormone, estrogen, which in turn lowers the risk of breast, endometrial and ovarian cancer in women. Don’t be quick to dismiss pain. Frequent sharp pains in your belly, pelvis and chest might be symptoms of stomach, ovarian or lung cancer. Some physicians ignore these symptoms. It is for this very reason that cancer can become deadly. Always insist on a comprehensive examination. Most cancers are curable when discovered early.